Dreams can come true for every little boy and girl, mom and dad, and grandparents, too, at Disneyland France. Disneyland is one of the most popular theme parks in France. In addition to the normal rides and games that Disneyland is known for, there is also a Disney golf course. There are several hotels at the resort. Disney Dreams is a spectacular show at Sleeping Beauty Castle. This night time laser and water show tells the story of Peter Pan. This is a daily parade. The themes change based on holidays/time of year, i.e. St. Patrick Day, Halloween, Christmas, summer, etc. All of the most popular Disney characters are in the parade. This dinner show is celebrating its 20th anniversary this year. Well-known western characters, such as Annie Oakley and Buffalo Bill, with cartoon characters such as Mickey, Minnie, Goofy, Chip and Dale explore the Old West. You will also be treated with typical Texan food that will provide an unforgettable experience. Animagique is a journey through Disney history, guided by Donald. Stunt Show Spectacular is a live action show that demonstrates how stunts are performed and filmed. Stitch Live is a drama show inspired by the movie, Lilo and Stitch. There are many rides at Disneyland Paris. The most popular ones are: Fantasy Land, Space Mountain: Mission 2, and Big Thunder Mountain. There is also great shopping at Disneyland Paris. Here you can buy a wide range of unique items including Classic Disney, Disney Pixar, and Star Wars items. In addition, candy, accessories, and clothes are available to buy. When looking to get away to a magical kingdom it takes planning. Good Neighbor Insurance is there to offer you peace of mind while traveling to another country for all your travel and medical insurance needs. 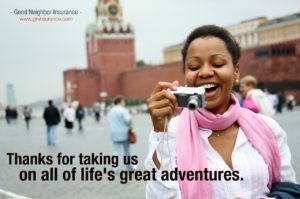 Check out our many travel and medical insurance plans at www.gninsurance.com. Contact one of our insurance specialists at 1-866-636-9100 for the best insurance options for all your traveling needs while on vacation overseas.